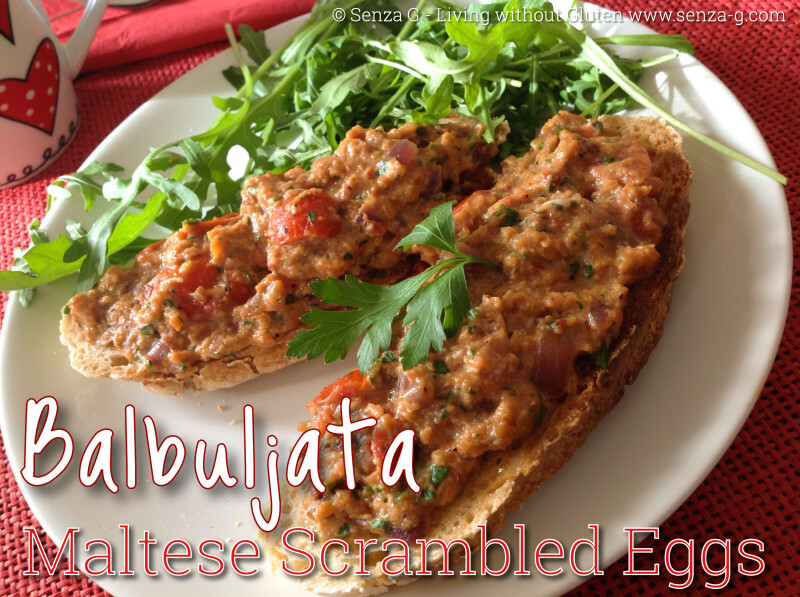 This is a Maltese Recipe, one that I never made myself … until today! I recently saw it posted by a Maltese Chef who has many years of experience in culinary arts, Anton B. Dougall and it actually enticed me to give it a try! Balbuljata, is metaphorically used in our language to mean ‘a big mess’. Used often when one has made a mess of things like for example in some school exam. The culinary Balbuljata is in fact a mix of sauteed tomatoes, onions and garlic and then beaten eggs added to it until they start to set. This is then served on Maltese toasted bread. I have adapted Mr Dougall’s recipe and added just a few ingredients more to it. * you can use 3 normal tomatoes, I only had cherry tomatoes. In a pan, saute the onions until soft and then add the minced garlic and the tomatoes. Cook until the tomatoes soften and then add a splash of wine and a dash of Balsamic Vinegar. Season and cook for about 10 minutes or until the tomato mix starts getting dry. In the meantime, beat the eggs lightly in a bowl, add the Parmesan cheese, if using and add this to the tomato mix in the pan. Lower the heat and add the chopped fresh parsley and a knob of butter. Stir continuously, same as when you make scrambled eggs until the eggs start to set. Serve on top of toasted buttered bread. Delicious!